Start of placement of orders: the third business day of the week, 8:00 a.m.
End of placement of orders: the auction day (the second business day of the calendar week), 10:30 a.m. (for orders to buy) and 11:00 a.m. (for orders to sell). Regardless of the selected delivery period, when orders to buy or to sell biomass are placed, orders must specify the quantity of delivered or accepted biomass per week. The second business day of the calendar week is the auction day. The same product is being purchased and sold, i.e. the biomass type and the delivery period match. The method for evaluating the quantity of delivered biomass (by measuring either the volume or the weight) used at the buyer’s site is acceptable to the seller, i.e. coincides with the method specified by the seller at the time of placement of the respective order. The maximum transportation distance specified by the seller is smaller than, or equal to the distance to the buyer’s site. The contract is only finalised if the order quantity (or the remaining unexecuted share of the order) is greater than, or equal to the minimum order quantity specified in the respective order placed by the other party. The price of the order to sell is smaller than, or equal to the price of the order to buy. The auction takes places according to the buyer auction principle, i.e. every order to buy is matched against all orders to sell that satisfy the conditions listed above. 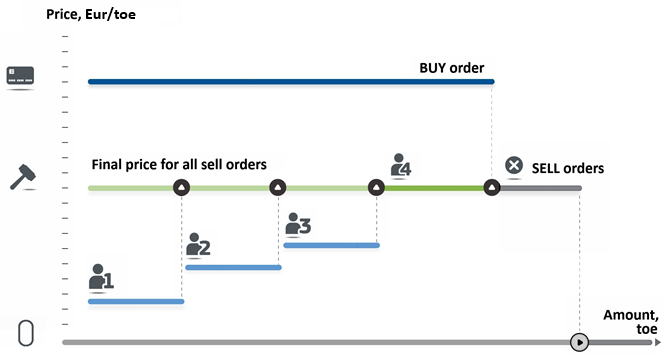 The final price of orders to sell is calculated with consideration to individual distances between the buyer and the seller. Orders to buy and to sell are paired with consideration to the maximum positive difference between the buyer’s price and the seller’s price. A contract is finalised based on the paired orders. If the quantities of grouped orders to buy and to sell do not match, the unsold or unpurchased balance of the order quantity remains in the trading system of the exchange and participates in other contracts (until validity of the orders expires). In case the remaining order quantity is smaller than the set minimum order quantity, the unimplemented share of the order is automatically annulled. This contract finalisation cycle is repeated until orders satisfying conditions mandatory for contract finalisation are available in the market. In the scheme, sellers (I), (II) and (III) will implement their orders in full, while the order of seller (IV) will be implemented partially. Sellers (I), (II) and (III) will receive for the biomass being sold the price that is specified by seller (IV), i.e. the buyer will pay all the sellers the price of seller (IV). It should be noted that the buyer will pay the price of the last seller rather than the price that the buyer itself specified in its own order (marked with the red line). Contracts in the Biomass Exchange are finalised electronically, in accordance with legal acts regulating trade in the exchange (active link to the documents of the exchange). On completion of an auction, ETS contracts are finalised automatically based on the orders placed by participants, without separate confirmation on the part of participants. Contracts are deemed to have been finalised from the moment trading results are announced. Trading results are announced on the auction day between 1:00 p.m. and 4:30 p.m. Following announcement of the trading results, participants based on whose orders contracts were finalised, via ETS and/or other means of communication, are provided with electronic copies of the finalised contracts of purchase and sale of biomass. There is no need to additionally sign the contracts of purchase and sale of biomass – it is deemed that contracts signed electronically have the same legal power as paper contracts. For the purpose of securing obligations of participants, participants must, prior to starting trade in the exchange and after finalisation of a contract, provide the Operator with a collaterals of obligations.